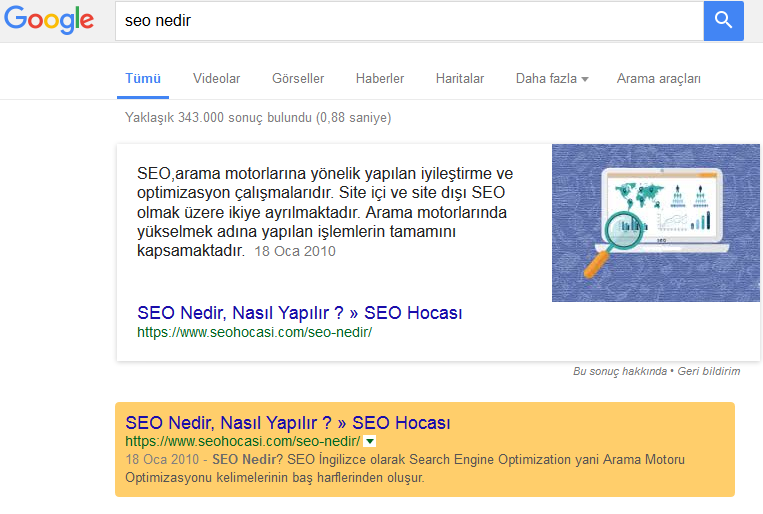 One of the larger SEO agencies in Turkey has confirmed that their main site has stopped ranking for their major keywords, and it has been major news in the Turkish webmaster and SEO forums since last week. And all signs seem to point to either a link manual action (they have been subject to repeated spam reports by other SEOs in Turkey) or real time Penguin. First, let’s look at what we know. The SEO agency SEO Hocasi, also known as Webtures, suddenly stopped well ranking for their major keywords, and they had held these rankings for many, many years and dominated this space in the search results. The company is claiming the reason is a “duplicate content penalty”, a technical error of duplicate content, but this particular situation doesn’t behave like usual duplicate content behaves. When you search for a long chunk of text in quotes, their pages do come up without being filtered. Their two other sites that they are also using does not seem to have the same content. The duplicate pages seem to be blog posts that were also posted on sor.seohocasi.com as well as the main site. But obviously, this isn’t how duplicate content works. First, there isn’t a duplicate content penalty. It is merely a filter that would remove the duplicated pages from the search results, pages that would still be shown as being filtered by clicking the link at the end of the search results. But that is clearly what isn’t happening here. Lastly, accidental duplicate content issues tend to be easily correctable when they are on-site. But the company’s response seems to indicate they believe it will be a much longer term impact. It also doesn’t appear to be any kind of Panda issue. When you start looking at their keywords, if you go deep enough into the search results, you would discover they dropped from #1 to around #60. 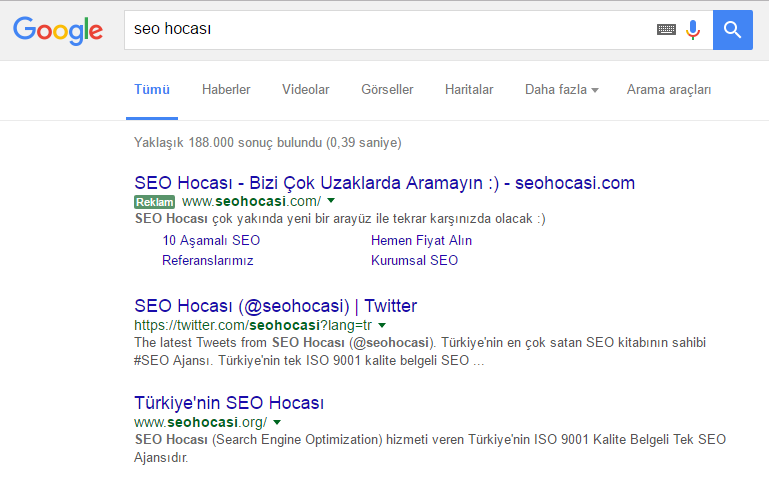 They don’t even rank for their brand name “SEO Hocasi”, however, they rank around position #60 for it as one word “seohocasi” only…. and there are a ton of spammier quality results ranking above them. The only time I could find them ranking at #1 was for “seohocasi.com” search, which showed their site complete with sitelinks. But this was the only example I could find. But for this query, this site is clearly the only one the searcher could be looking for, and it is most often done as an accidental search when the intention was the go to the homepage instead. They still do have almost 7,000 pages indexed in Google right now. Here is how they were looking just a week ago, according to ahrefs. And as of last week, for the popular “seo nedir” term (“what is seo”), they not only ranked #1 but also had the featured snippet, according to SEMRush. For the term “seo”, they ranked #3, only behind two Wikipedia entries. When looking into it, it appears that their method of link building was the likely reason behind the loss of rankings. The source for their link building was the SEO Hocasi WordPress theme, which could be found here, although it has been now turned into a 404 not found, and prior to that it was 301 redirected to the homepage. Of course, using a 301 redirect on that page would have pointed all links to the WordPress theme to the homepage. It was marketed for years as a “Full SEO WordPress Theme” and bragging about how users of the template would lead in the search for their keywords. 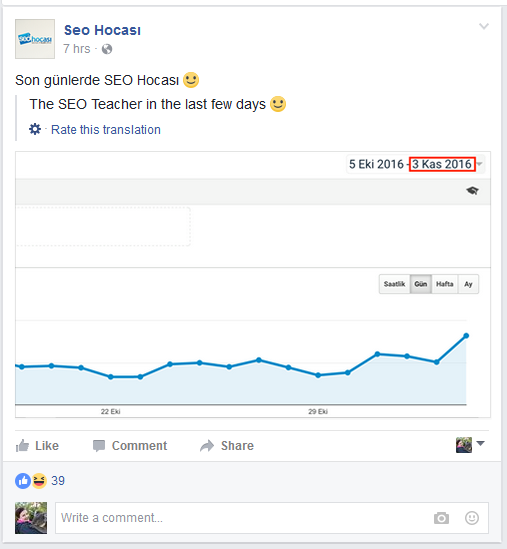 But it was obvious that only SEO Hocasi was benefiting from these SEO links. In this case, the templates were also made with not just footer links, but also some were optimized with hidden links. So those using the templates, especially those who were less technically savvy, would never have noticed they were linking to an SEO agency with rich anchor text. They most recent version appears to be V3 of the theme, which included multiple dofollow links to their site and other SEO sites. And they also added the sketchy tactic of rendering the theme unusable if someone did try and remove or change those links from the theme. For the curious, you can find a copy of it here. It is almost laughable that this was how they were building links. While it was more common for SEO agencies to be doing this 5-6 years ago, this practice was mostly dropped because it was high risk and spammy. In fact, it has been included in Google’s own Link Schemes page under the quality guidelines for years. Perhaps they thought since they weren’t linking to pharmacy or casino type of sites, they weren’t at risk. When you look into it, the anchor text was also clearly manipulated. While they could have possibly made a case that linking with their site name, although it was pretty rich anchor text as well, looking at the rest of the anchor text, and how they got those links, it becomes much spammier. 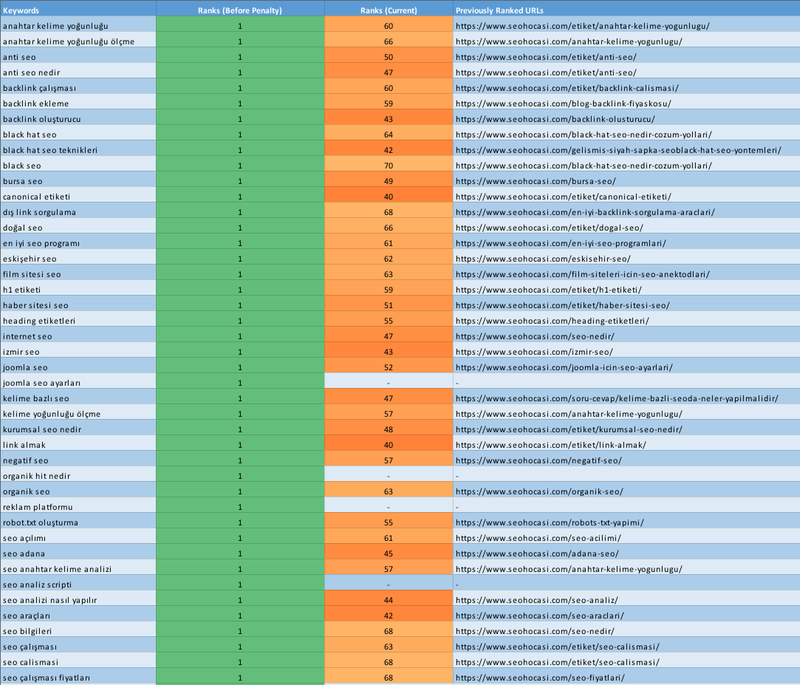 When looking at Majestic data, they can see they were definitely manipulating the keywords. While a good portion of the anchor text was the company name or URL – SEO Hocasi, which translates to mean “SEO Coach”They also used a mix of English and Turkish anchor text. Also not reflected in the pie chart is that their top “anchor text” is actually no text at all, there are multiple links to their site where it was merely linked as <a href=”http://seohocasi.com”></a> without any text or images in the link. Their landing page for their template also racked up over 3 million backlinks, out of the 7 million for the site. This also likely explains why they no longer rank at all for their brand “SEO Hocasi” since this was clearly one of the heavily optimized keywords with these template spam links. Penguin, Manual Action, or Something Else? What is interesting that many of their keywords went from ranking #1 to #60-70, a pretty heavy demotion, and indicitive of something manual by Google. And there doesn’t seem to be any other explanation for the drop. They didn’t recently change to HTTPs and they didn’t seem to have any server issues with would cause it. Is this a manual action? Well, this site has been subject to spam reports, including one on the Google Webmaster Help forum last week and this could have certainly raised its profile. But we also know that Google will periodically tackle specific languages if they see there is a spam issue, so this could be where repeated manual actions could come into play. And there has been complaints previously about spam in Turkey. And with a manual action, Google wants to see some of the links actually removed, which could take some time when they have built links via footer links. Couple this with the fact the template will actually break for many users of this template means sites would be less likely to want to comply with a link removal request. Could it be real time Penguin? We know Penguin now devalues the power of low quality links, and since it seems the vast majority of their links were created over many years with these template links, it wouldn’t be surprising to learn Penguin is the culprit… unless the company confirms a manual action. There is always the possibility of a disavow removed under the misguided “don’t need to disavow for Penguin” and a manual action did come into play. It is possible these links have been disavowed, but it doesn’t make sense that rankings would have sustained for years while continuing to build links via WordPress themes until last week. However, with most rankings dropping by 60 spots, there is clearly something happening that isn’t duplicate content related. The consensus seems to be that these links finally caught up with them. It has also been a hot topic on Twitter. This was huge news in Turkey, with many asking questions about the site seemingly vanishing in Google. 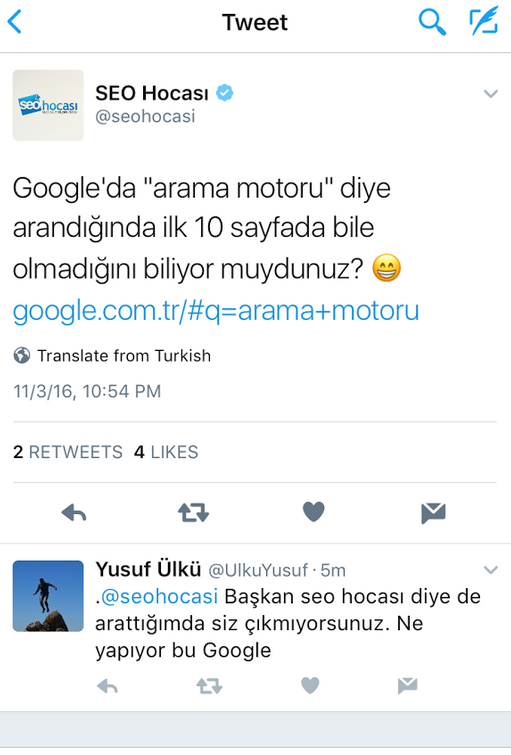 SEO Hocasi posted about the situation on Twitter by joking “Even Google is not listed for the keyword ‘Search Engine'”, but later deleted the tweet after people began tweeting back that at least Google ranked for their company name. They also posted a screenshot on Facebook, showing that they weren’t concerned with traffic to the site. However, one has to wonder how much of that traffic was as a result of looky-loos wanting to visit the site Google demoted. They also did a live Facebook video stream yesterday. Roughly translated, they said, “We don’t care about the penalty, everything is fine. We are penalized by Google because of redirecting our Q/A folder into incorrect URL. The reason is duplicate content only.” But as I outlined above, this definitely is not behaving like any kind of duplicate content issue… again, duplicate content is a filter only, it doesn’t do mass demotion across all keywords. Bottom line, their attitude seems to be that it’s no big deal and they don’t really care. They have made a recovery attempt, which involves creating multiple copies of their site webventures, with seohocasi domain names. 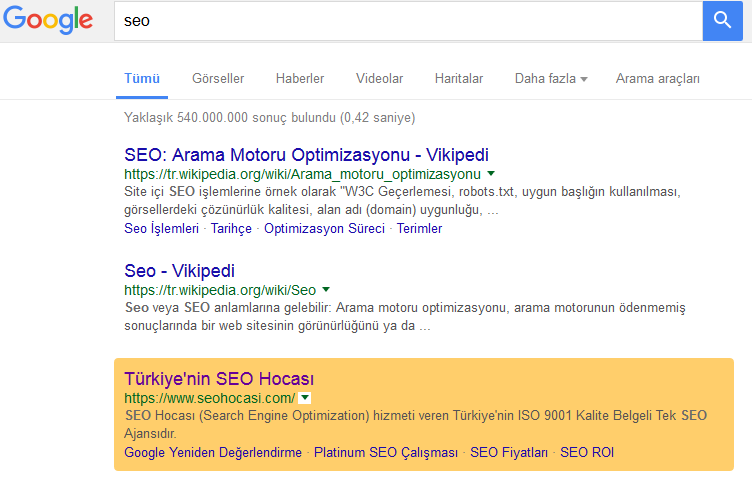 So they now rank for “Seo hocasi” once again with seohocasi.org, although that site is immediately 301 redirected to webtures.com.tr, which is then 302 redirected to the https version. They have also redirected seohocasi.com.tr to webtures. They are also running AdWords, where they are joking about being back soon with a “new interface”. They also added push notifications, so every visitor is asked if they want to be notified of any changes. While it definitely isn’t usual, Google has penalized SEO agencies previously, most notably when iAcquire was penalized for buying links for clients. But the majority of sites within the SEO agency that are penalized do have to do with manipulative link buying and selling, such as when they took down link sellers Teliad and Rankseller as well as link networks in Europe, Germany, Japan and Poland (twice!). I did reach out to SEO Hocasi for more details over a day ago, but haven’t heard back. But they have many the numerous public comments detailed above. 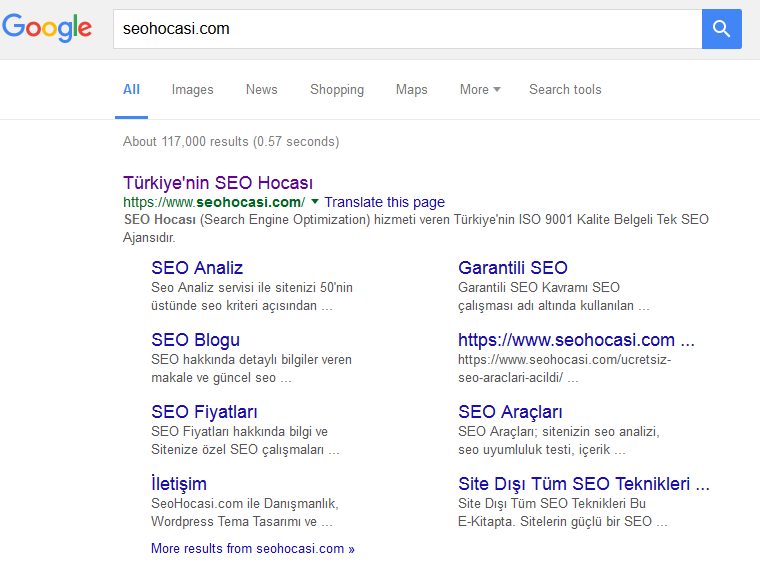 Hat tip to SEOs in Turkey who provided information and stellar translation skills. They are appearing back in the search results for some of their keywords. Wow, thanks for sharing all these stuff Jeniffer. I really impressed your work for understanding a penalty in different language than English. It looks like a noob agency who want gain a trust by exact-match anchor texts. We used to see this kind of agencies in India on everyday. 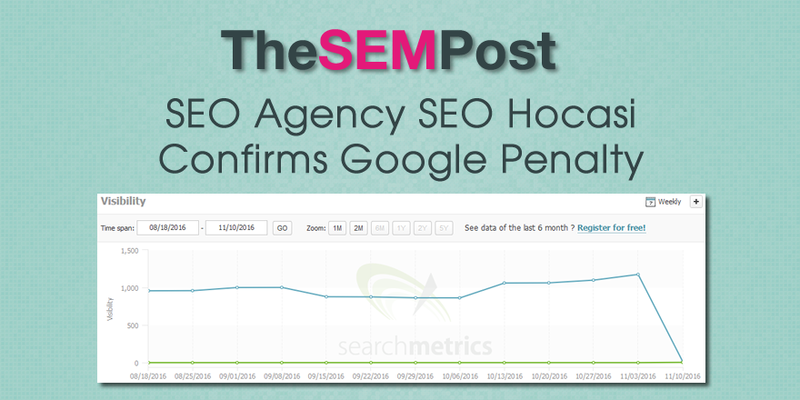 This penalty might be great example for all low-quality SEO agency around the world. I’ll keep informed my followers. It is an SEO agency, right? How they could able to blame duplicate content for such a wide penalty like this?! SEO visibility is dropped to 15 from 1175 (%98 drop) and it is because relaunching Q&A section accidentally? It is quite sad for Turkish SEOs if they really believe in to these excuses. Yep, I agree. But I think they were trying to blame it on a technical mistake than rather than “Google penalized us because we broke their guidelines for years.” Also interesting is they have many, many posts about Penguin on their blog too, going back years. Hello, The theme page doesn`t exist anymore on their website, It redirects to the plugins page. What do you think they are trying to acheive with that? Well, with bad backlinks still pointing to it, a redirect is not a very good decision.